PINE BLUFF, Ark. – Because Arkansas livestock are bred to give birth in the spring, late May or June is usually the time to vaccinate livestock, says David Fernandez, Cooperative Extension Program livestock specialist at the University of Arkansas at Pine Bluff. Livestock get their immunity from their mothers’ milk at birth. But, by the time they are 2 to 4 months old, they begin to establish their own immune system. Vaccines cost only $3 to $10 per calf and 50 cents to $1 per lamb or goat. With prices for calves hovering around $2, kids at $2 and lambs at $1.35 per pound, even a pound of gain lost to a preventable disease would cover the cost of the vaccine. The price of a single animal lost to a preventable disease would pay for the vaccination program for an entire herd or flock in most cases, Dr. Fernandez reminds ranchers. There are two types of vaccines – killed and modified live. Killed vaccines are made from dead microbes or their parts. Modified live vaccines are made from weakened microbes that cannot cause disease. A primary reason vaccines fail is that producers forget they are using a live product, says Fernandez. Modified live vaccines must be kept cool and out of direct sunlight as ultraviolet radiation from the sun kills bacteria. Vaccinate calves before weaning for blackleg (using either a 7-way or 8-way vaccine), IBR-BVD-PI3 and leptospirosis. Most producers also vaccinate their heifers for brucellosis between 4 and 12 months of age. Some producers may want to vaccinate against such respiratory diseases as bovine respiratory syncytial virus, pasturella or Haemophilus somnus. Lambs and kids should be vaccinated for clostridium CD&T. This will protect them against the two most common forms of overeating disease and tetanus, says Fernandez. Schedule this vaccine about four weeks before they start eating solid feeds, especially grains. 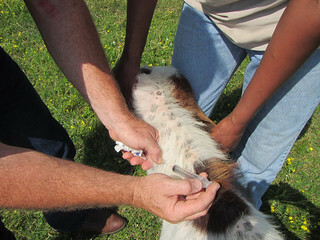 Some ranchers vaccinate them against caseous lymphadenitis, called CL or cheesy gland, but others prefer not to do so if CL is not present in their flock or herd. Lambs and kids can also be vaccinated for pasteurella if it is a problem in the herd. Work with your veterinarian to develop a plan for other diseases if you have problems specific to your flock or herd. For more information on this or other livestock questions, contact Dr. Fernandez at (870) 575-7214 or Fernandez@uapb.edu.